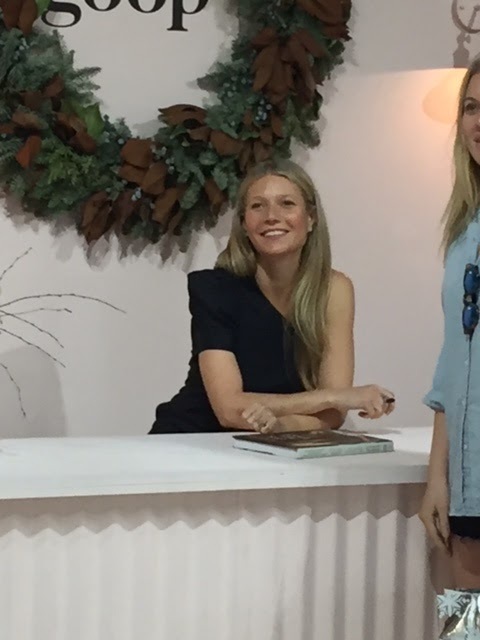 If you have ever even glanced at my blog, you will know that I have been obsessed with Gwyneth Paltrow for years and I know I am not alone. I have seen most of her movies many times and own quite a bit of them. Favorites are A Perfect Murder, Shakespeare in Love, Emma and Sliding Doors. There is so much hate out there for her and I am one of those people who just don’t understand why. But…that is a whole other post…. 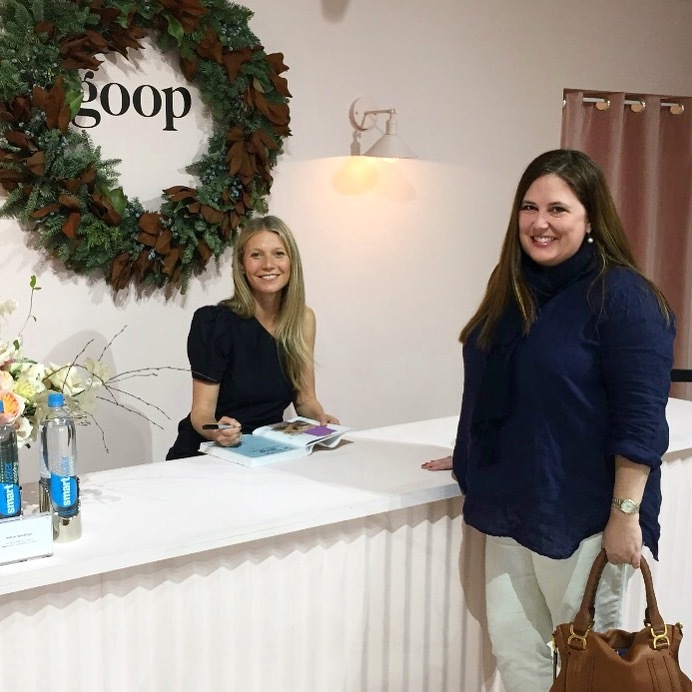 Last week, I got a text from Grimsley with the screen shot of GP’s Instagram post letting her peeps know she would be at her Goop Gift pop up the next day from 3-4pm. Holy cow, my head was spinning with this news. It is C R A Z Y at work these days and I have been running around like a madwomen trying to sell as much as possible before Christmas but not much could have stopped me from going to see her. Helen moved back our department celebration to accommodate my plans. Friday, I left my office around 2:20 and headed to the Design District. I parked and went to find the store. 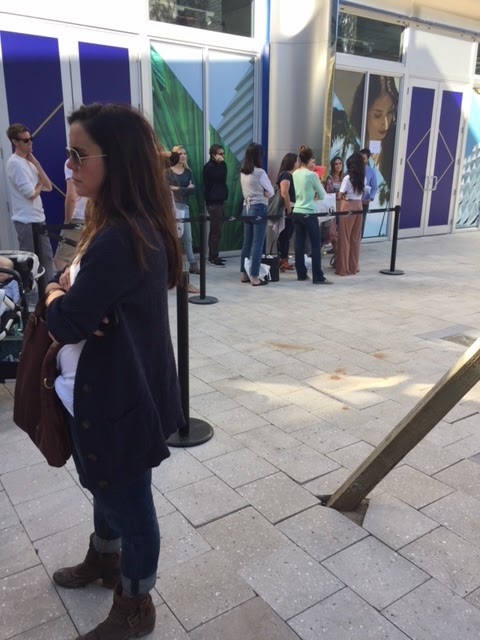 There was already a small line that had formed. As soon as I was standing there, alone, I realized how crazy that none of my co-workers had wanted to come with me. Not long after, I made friends with some girls in line and we chatted away all sorts of Gwyneth nonsense. Everyone has a GP story. One of the girls in line’s niece was her nanny. Verdict? She was ok but Chris Martin was the most amazing guy and super duper nice and everyone loves him. Hmmm. Then, one of her workers clad in an all white industrial looking jumpsuit came out and let everyone know that they would be selling the books in line to keep things moving along. 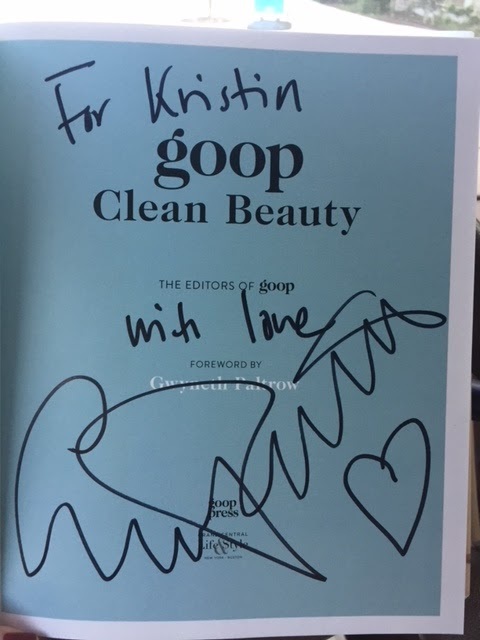 I bought her Goop Beauty book and they filled out a post-it so she would know how to sign it. They also handed out tons of Smart Water to everyone, so nice. Then she arrived…fresh from a huge Escalade, looking fabulous in a black dress and sandals. The paparazzi attacked her and it was a wonder she made it inside. Then things started speeding up. They let some people in who had already purchased their book. A while later it was our turn. We walked inside and formed the line on the left. There were security people keeping it all in check and there was little room for error. When it was my turn, I walked up and seriously not sure how I formed a sentence. I told her it was a thrill to meet her and she was so nice. She signed my book and the security dude took my picture. Can you see how hard I am smiling here? No joke, that was how happy I was. I bolted out of there when I was done to make it to my late lunch and didn’t check the picture until I was in my car. Thank goodness it was good. The whole experience was amazing and she did not disappoint. I was on a high for days. What an amazing experience! 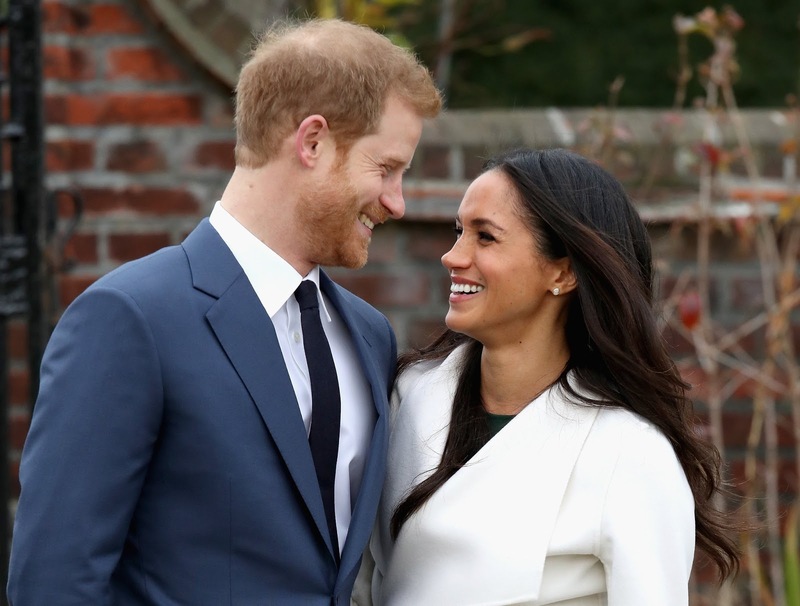 Not sure about you, but I am still on a high from last week’s Royal engagement news of Harry and Meghan Markle. Such fun, happy news in between some rather dark news days. They look so deliriously happy and in love, it’s hard not to get on board. 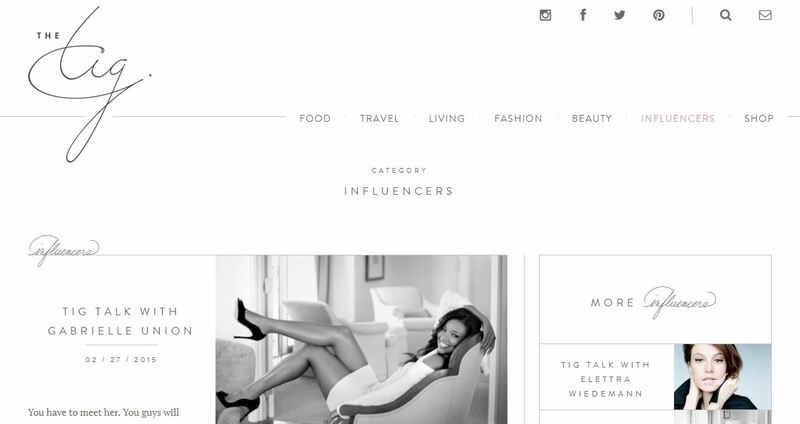 Personally, I have never watched Suits, so I only know about Meghan from the press since she started dating Harry, but she has been on the Today Show commenting on fashion and even had her own blog call The Tig. Once her future started veering towards the UK, she shut down her blog and that happened before I could check it out. 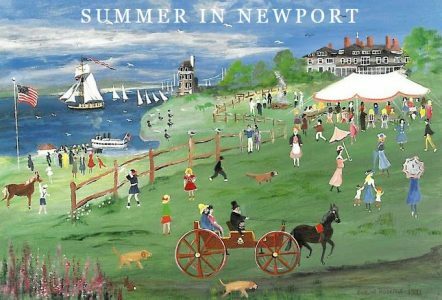 I just found a link to the archives of it and it is very interesting to read. Click here. I am so excited for the months ahead with all the Royal wedding news and of course, the arrival of Kate and Will’s 3rd baby. Experts are betting that a girl will be Alice, Victoria or Elizabeth and a boy would be Arthur, Frederick or James. We will have to wait and see on that. It has also been reported that Kate plans on having this 3rd baby at home. 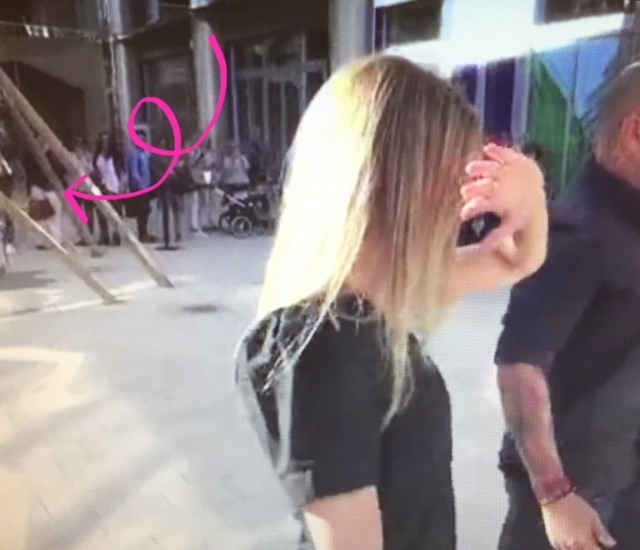 Remember when she popped outside on the steps of the hospital with her blowout mere hours after Charlotte’s birth? It was amazing. If there are no perceived complications, I think the home birth is likely, home being Kensington Palace!